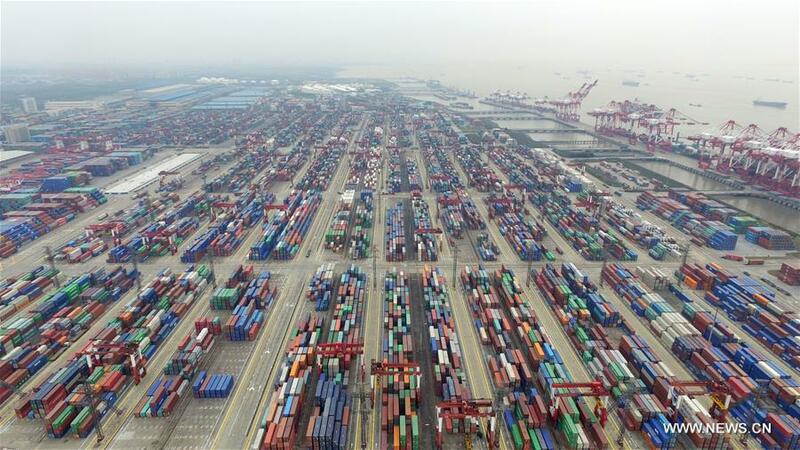 This aerial photo taken on March 29, 2016 shows a view of the free trade zone in Shanghai, east China. China's GDP stood at 15.9 trillion RMB yuan (2.4 trillion U.S. dollars) in the first quarter this year, growing up by 6.7 percent year on year, the National Bureau of Statistics said on April 15, 2016. China's National Bureau of Statistics (NBS) has adopted a new method of calculating GDP that it says "better reflects the contribution of innovation to economic growth." Research and development (R&D) expenditures that can economically benefit companies will no longer be calculated as intermediate consumption, but as fixed capital formation, the NBS said in a statement. The adjustment was made according to the 2008 SNA (System of National Accounts), which was unveiled by five international organizations, including the United Nations, in 2009 to provide a "comprehensive, consistent and flexible set of macroeconomic accounts." The NBS will use the method for future GDP calculations, and has also recalculated all figures dating back to 1952. GDP for the previous six decades all rose due to the reform. In the past decade, the average annual increase in GDP volume due to the adjustment was 1.06 percent. Recorded GDP growth rates in the past 10 years rose by an annual average of 0.06 percentage point. The growth rate for 2015 remained at 6.9 percent, revised upward by 0.04 percentage point. The reform can "better reflect the contribution of innovation to economic growth," the statement said. In recent years, China has promoted science, technology and creative development, with rapid growth in R&D expenditures and an increasingly important role for R&D to economic growth. However, the old calculation method failed to reflect the importance of R&D, as intermediate consumption only measures value of goods and services that are transformed or entirely used up in the course of production. In reality, R&D expenditures that yield economic benefit should not be considered "completely used up in the accounting period," and thus should be recorded as fixed capital formation, according to the 2008 SNA. At present, most member countries of the Organization for Economic Cooperation and Development (OECD) and some developing countries use the 2008 SNA framework to calculate R&D expenditures. For the world's second largest economy, reforming the GDP calculation method according to the same framework will bring China's GDP figures more in line with those of other countries, the NBS said.